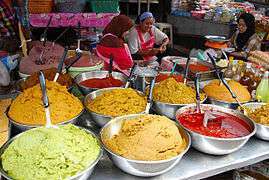 A condiment is a spice, sauce, or, preparation that is added to food to impart a particular flavor, to enhance its flavor, or in some cultures, to complement the dish. 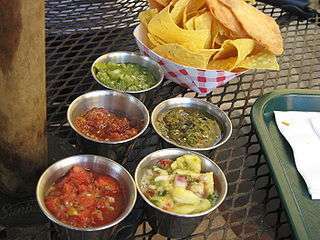 The term originally described pickled or preserved foods, but has shifted meaning over time. 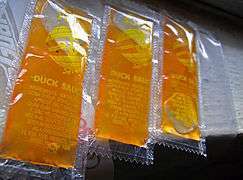 Many condiments are available packaged in single-serving packets, like mustard or ketchup, particularly when supplied with take-out or fast-food meals. 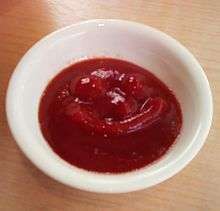 They are usually applied by the diner, but are sometimes added prior to serving; for example, in a sandwich made with ketchup, mustard or mayonnaise. 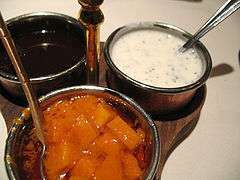 Some condiments are used during cooking to add flavor or texture to the food; barbecue sauce, compound butter, teriyaki sauce, soy sauce, and marmite are examples. 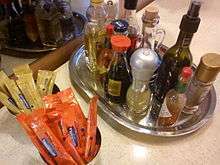 The exact definition of what is and is not a condiment varies. 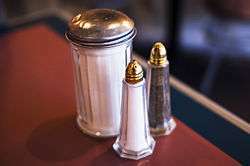 Some definitions include spice and herbs, including salt and pepper, using the term interchangeably with seasoning. 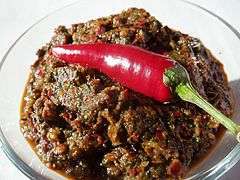 Others restrict the definition to including only "prepared food compound[s], containing one or more spices", which are added to food after the cooking process, such as mustard, ketchup or mint sauce. Cheese is also considered a condiment in some European countries. 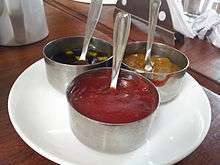 Condiments were known in Ancient Rome, Ancient India, Ancient Greece and Ancient China, and were often used to improve the taste of spoiling food; before food preservation techniques were widespread, pungent spices and condiments were used to make the food more palatable. 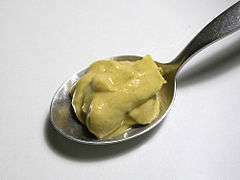 The Romans made the condiments garum and liquamen by crushing the meat of various fish and fermenting it in salt, leading to a flourishing condiment industry. Apicius, a cookbook based on 4th and 5th century cuisine, contains a section based solely on condiments. 1 2 Sax, David (October 7, 2010). "Spreading the Love". Bloomberg Businessweek. Retrieved 9 October 2010.